I have always wanted to travel through the Transibirian railroad. Now i have done it. I do not really know what I had for expectations before the trip, but it was a mysterious experience. The train was quite inconvenient, and the cabins were small. Sometimes we shared a cabin with others, but we also had our own cabin with a double bed. We met people from every corner of the world, all with different dreams but with one thing in common; we all loved to travel. 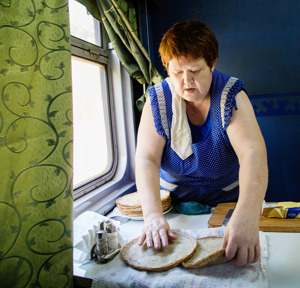 The train from Moscow to Irkutsk in eastern Siberia took four days. We stayed there for a couple of days at the Baikal Lake before we proceeded to Mongolia. In Mongolia, we lived in Gun Galute Nature Reserve and went on a trip before leaving Beijing. The last trip we met this amazing woman, Gabi Tovagyl. She worked in the tram and cooked soup on a small hotplate between the trolleys. She worked extremely hard but was happy to have a job. I sent a couple of pictures to her and I think she was pleased that someone noticed how hard she was working. A warm and nice woman I hope to see someday.